Few enterprise IT transformations can match the importance of today’s long migration from on-premises, client-server computing to cloud computing. This week at Oracle’s mammoth OpenWorld conference in San Francisco, Oracle will make it abundantly clear that it intends to become a leader in all three flavors of cloud -- not only SaaS, where the company has already demonstrated strength, but also in PaaS and IaaS, where Oracle is a new player. Last Friday, in advance of OpenWorld, IDG chief content officer John Gallant and InfoWorld editor in chief Eric Knorr interviewed Oracle co-CEO Mark Hurd to get his take on Oracle’s cloud growth strategy, its new cloud initiatives, and Hurd's take on what customers want from the cloud. This interview has been edited for length and clarity. John Gallant: You had your Q1 earnings announcement yesterday, and obviously, there are a lot of people focused on the specific numbers around PaaS and SaaS and other things. I wonder if you could give a progress report on the transition to the cloud, one that’s more focused on things that would be meaningful for an IT audience than the financial audience. Mark Hurd: First the numbers we produced yesterday were, I think, astounding. We grew 82 percent in our cloud, SaaS, PaaS revenues. We had over 40 percent growth in our bookings number, which was following up on a year ago when we had 166 percent growth in our bookings number. All these numbers sort of blur together, but I think the theme is they’re really big. They’re exciting, and now our numbers are meaningful. We passed the $800 million mark in absolute revenue in the quarter. You can do the math with our bookings. Take the Q1 bookings, and over time that will provision into the base as well. It is a large business that is getting bigger. What’s interesting is that as our business has gotten bigger, our growth rate has actually gotten bigger. I announced yesterday this was our seventh consecutive organic growth rate increase so this is just a long time of getting bigger. If Amazon is at 58 or 59 [percent], we’re at 82, [Microsoft] Azure is slower than Amazon. I think it’s a testimony to a few things. Certainly one of them is the way customers now want to buy. I think that part of this is Oracle; part of this is the market. For us, we’re building great products. I think that’s the best, most obvious reason why you see the numbers you do, but in addition to that, it’s what customers want to buy, the way they want to buy it. I think that’s probably just as important as anything we’re doing here. Eric Knorr: I would imagine most of that cloud growth has been driven by SaaS at this point. MH: Both. It’s SaaS and PaaS. EK: In the earnings release, Larry Ellison talked about your next-generation infrastructure-as-a-service offering and saying that Oracle will deliver twice the compute, twice the memory, four times the storage, 10 times more I/O at a 20 percent lower price than Amazon Web Services. How will you do that? MH: A couple things. One is relative to somebody like Amazon, we actually own the entire stack, so we get the opportunity to bring in best-of-breed components but also to optimize them as an integrated system. We have a very large advantage in terms of the depth of our knowledge and our technology at each layer of the stack. EK: By that you mean the hardware as well. Right? MH: Really inside the hardware at the silicon layer -- the way we deal with silicon; the security in the silicon, the performance of the silicon. You really drive that and align that directly to the operating system or opportunity to be the leader in operating system technology, the ability to integrate that into Flash, the interrelationship not just into compute but storage as well. Obviously, our knowledge of database systems, authoring languages, Java. We have a tremendous stack that most people don’t. Most people are bringing in open source tools they didn’t build, tools they certainly didn’t optimize. Second, we get the benefit of having run datacenters in SaaS and PaaS. We get the benefit of the next generation of datacenters, to Larry’s point. There is an advantage sometimes to being able to do something better than people did it the first time. That combination of our technology, our depth of knowledge -- we bring to this a lot of weapons to the fight. EK: One of the things about IaaS is that it demands a huge investment in infrastructure, in building out the datacenter capacity to be able to compete. What kind of investment plans do you have to compete in IaaS? MH: We have made a lot of investments. Today, we’re in 20-plus global datacenters. I’ve trotted around the world announcing datacenters over the last couple of years as we’ve opened them up and brought technology and capability to the market. Our capex has been significant. We continue to invest, but again, remember we get to invest against our cost base as opposed to somebody’s price base, so it’s a big advantage. For example, if you’re Amazon, you’re going to buy virtually everything. You own nothing. When we buy an operating system it’s free. When we get a database, whether it’s MySQL, whether it’s the Oracle database, it’s free. When we get Exadata, it has a few components that we bring in and we buy it at cost. Our capex will never match the capex that you’ll see from somebody else because it doesn’t have to. EK: Can you give anything rough in terms of capex numbers? MH: No. We won’t do that. We’ve never really done that over the past several years, although you can see in our balance [sheet] over the past couple or three years the billions of dollars of capex that we’ve invested. I’m not going to give you a forward-looking capex, but in terms of backward, it’s all out in the public domain how much capex. EK: But to be clear, you do plan to own and operate that infrastructure. You’re not going to be partnering with others to provide that globally? MH: When you say partnering, we do a combination of [colocation] as well as our own, so we have a mix, depending on whether it’s a SaaS capability, PaaS capability, or infrastructure capability. JG: I want to explore this again from the perspective of a CIO and make sure we understand your strategy in that IaaS market. One, is what you’re doing make that more enterprise ready than perhaps the other IaaS offerings out there? The other is, I guess philosophically, why be in the market at all? It’s a price-driven market. It’s going to be brutal competition in that market over time. We’re already seeing some of that. Why does Oracle need to be in that rather than simply competing in the SaaS and PaaS world, which are much higher-value worlds? MH: It’s what customers want. [But] I like the crux of your question. If you take a step back and look strategically, what’s happened in the market? The market has historically been there’s a trillion worth of spend in IT. Half of it is consumer, half of it is spent by enterprise. That’s everything to me that’s not a consumer. The half that’s enterprise has not grown much. When you look at the problems, you actually look at cloud as an economic issue, not just a technical issue. The problem you have is that most CEOs are going against a market with 2 percent GDP growth, 1 percent S&P 500 growth, so there’s not a lot of revenue growth. The only way to get revenue growth is to steal market share from somebody. Most CEOs are doing two things at the same time. They’re cutting expenses. When you see S&P up 5 percent and revenue growth up 1 percent it tells you something real quick. They’re cutting expenses. They’re cutting expenses at the same time as they’re trying to steal market share. When you try to align an IT strategy against those two initiatives, you tell the CIO: Get me systems focused on better understanding customers, better understanding the market, and cut the damn expenses. Now most CIOs are sitting with a hand of 85 percent of their spending spent to keep the trains running, so they don’t have tons of flexibility. At the same time, some CEO or the board of directors tells the CIO: Hey, secure this infrastructure so that nobody hacks me. And the guy says: OK, I’ll spend some more money on security or get a consultant. That’s all coming out of my [remaining] 15 percent. At the same time, if you’re in a bank or you’re in pharma, there’s a bunch of compliance guys that run around saying I want you to do a Monte Carlo simulation. That all comes out of these innovation dollars. The CIO has a complex environment. Remember what all of us, starting with Silicon Valley, have done to CIOs. We sold them piece parts for the last 25 years, and they’ve assembled them, and they’ve put big IT staffs in place and created very complicated configurations, all chasing procurement benefits, and what they’ve created is this very complex, kludgy environment. I tell you all of that, John, against a backdrop of a really complicated, expensive IT environment that isn’t providing tons of new innovation. At the same time, the consumer is innovating like crazy on the other end. Many of our customers who are B2C are really, really stressed. That’s why cloud is an irresistible force. This isn’t just a technically better mousetrap. This is an economically better mousetrap. Cloud simply costs less money. It costs less money at the same time it's giving you an innovation engine that isn’t built on your IT budget. It’s built on Oracle’s R&D budget. At the same time, it’s more secure and it’s simpler. The simple gets back to the core of your question, which is I’m going to do SaaS in the Oracle environment. I like Oracle’s tools. I like Java. I like Oracle Linux. I like the Oracle database. But, you know, Oracle doesn’t want to provide infrastructure because they don’t like the margins, so I’ll take all that stuff and use Amazon for bare metal, then I’ll interrelate the workloads between Amazon and back to the Oracle cloud, and somehow I’ll bring it back on-premise when I need to. That’s really complicated. By the way, you could make an argument, John, to your first question. Why would we ever do PaaS when you’ve just done SaaS? Win the apps and you get everything that goes underneath the app. Well, our view was that our customers are going to want to extend the apps. Not customize them but extend them, and they needed to have those in the same platform. They then were going to want to run that platform on the same infrastructure, and they want that integrated into the platform. They want the platform integrated into the applications. Over the last decade, that’s how we’ve evolved into this strategy and the reason it’s so robust is because that’s what the customer wants. The customer wants one-stop shopping as much as they can. I don’t think customers are going to have one cloud, but I don’t think most big customers are going to have 10. I don’t think they’ll have five. I think they’re going to look for a couple, three clouds and get as much out of those couple, three clouds as you can. EK: Mark, you want to be the primary cloud for these customers is one way of looking at it. MH: We want to be a primary cloud. If I was divining an IT environment and I was a customer, I’d be saying to the CIO: Let’s get as few of these guys in here as possible. I don’t want a lot of complexity. I want big guys that can plow a lot of R&D into things to give me a lot of extension of my capabilities. I want to be secure. I want to be simple. Get me a damn good price. Get me a little bit of leverage, so I have a little bit of choice here and there. What’s happened for years, I think, is that CIOs started to chase nickels and dimes, and the nickels and dimes cost them hundreds and hundreds of dollars. Next thing you know you have a Dell server, an HP server, an IBM server, an Oracle server, whatever. Then I chase Red Hat operating systems, AIX, HP. I’ve chased all these different data and what I have now is this kludgy environment. I tell our customers when they say to me: Can you assure me that your security is the same as ours on-premise? And I would say I could never make it that bad. I could never do it. We have one configuration, one; one piece of hardware, same OS, same database. You have infinite combinations of technologies, and the ability to secure that is really hard. Who’s doing it? You’re doing it on your nickel. It’s a very expensive, complex strategy. JG: What should we expect at the OpenWorld conference next week? MH: We’ll have a pretty strong set of releases in every category. There will be a suite of SaaS announcements across industries. There will be a suite of SaaS announcements across various product categories. We’ll have some new HCM [human capital management] announcements, new ERP announcements. We’ll have a set of infrastructure announcements, probably 10 to 11 pure infrastructure offerings. Along the way we’ll talk about Database 12.2 that we’ll bring to the market. JG: What are you going to cover in your keynote? MH: I’m going to talk a little bit about the pressures on CEOs and CIOs. I think we have a lot of people that still wonder whether cloud is a fad, and clearly we have a lot of competitors that hope so. They really pitch private clouds and all of these things. I’ll try very hard to explain why this is going to go. I’ll do some predictions about what’s going to happen by 2015. I did some last year; I’ll do some more this year. There are some startling numbers. Last year I predicted all of dev/test would move by 2025. I think almost 40 percent of it has moved already. That’s 30 percent of all of IT. I’ll do some predictions. I have a set of customers with me that will talk about what they’re doing in terms of application strategy, dev/test strategy, etc. 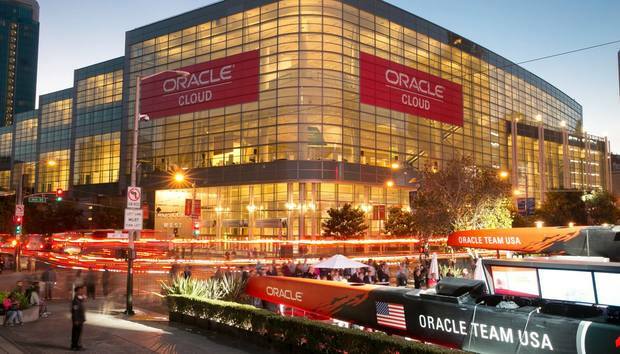 JG: So much is written about Oracle’s transition to the cloud. It gets a tremendous amount of coverage. What are the errors or misperceptions about that transition that you would correct? MH: Forget what anybody thinks or anybody’s perception is, it’s just numbers. When you see numbers like we had in Q3, you see what we did in Q4, and you see what we did in Q1, somebody is deciding to buy a lot of stuff. It’s a lot of business. Look at what’s happening in ERP and look at what’s happening in HCM. Our growth was over 40 percent quarter on quarter in ERP. Our growth in HCM was 131 percent. Our PaaS growth again, quarter on quarter. This is an amazing opportunity for us because most of what we have in our cloud is new customers. The bulk of our base is just now moving. I gave the stat last night that this quarter more than 50 percent of our apps that we sold had never been an Oracle applications customer before. Every quarter we’ve been as high as 70 percent. That’s not a current number. That’s been three or four quarters back. Seventy percent of our customers in the quarter that we had closed them had never been an Oracle customer before. The bulk of our ERP customers, the bulk of our HR customers still have not moved. They’re moving. Don’t get me wrong. And, by the way, look at our renewal rates in support. It isn’t changing. Our on-prem customers are stable. Some are moving, and we’re getting a whole bunch of new customers, and I’m not sure that this isn’t the most exciting cloud story out there.